August 25, 2013 at 7:00 p.m.
All tickets are $150 for this special event. Legendary duo David Crosby and Graham Nash will perform a special 90-minute concert at 7 pm on Sunday, Aug. 25, 2013 at The Pasadena Playhouse to raise critical funds for the nonprofit organization, Five Acres. Crosby and Nash will break from their world tour for one night only in celebration of Five Acres’ 125th anniversary and the critical work the social services agency provides to over 6,500 children and families in crisis each year. This exclusive concert is open to the general public with proceeds benefiting Five Acres’ Permanency Fund – to ensure the agency’s long-term commitment to children and families in crisis. Five Acres is a pioneer in providing successful solutions that ensure safety, well-being and permanency for children and their families. Founded in 1888 as one of Los Angeles County’s first orphanages, Five Acres has been committed to preserving effective programs and developing more effective prevention services for children and families in crisis. Services include: residential care and education, a non-public WASC accredited school, mental health services in homes and schools, foster care and adoptions and domestic violence prevention. For more information, visit www.fiveacres.org or call 626-798-6793. As a duo, longtime creative partners David Crosby and Graham Nash bring out the best in each other, their distinct yet complementary styles balancing an equation that delivers a seamless and inspiring musical whole. Two-thirds and one-half, respectively, of Crosby, Stills & Nash, and Crosby, Stills, Nash & Young, these Rock and Roll Hall of Famers are legendary for their airtight and crystal-clear vocal harmonies, as sublime when delivered by simply these two together as they are from the larger configurations. It is a sound that’s one of the true touchstones of the rock ‘n’ roll era. Native California David Crosby and England-born Graham Nash first met and 1968. Together, they generate a magic that transcends their individual resumes and they carry their legacy of timeless songwriter, indelible vocals and peerless harmonies into the future. Whole Foods is offering Fresh, wild Alaska salmon! Their buyers in Alaska work directly with fishermen so that we can offer wild salmon as soon as they start running. It’s never frozen, which means you get that incomparable fresh summer salmon flavor. This sale is one day only so make sure that you stop in this Friday, August 2nd to hook this sweet catch! Remember, Alaska wild-caught Coho salmon is only available for a few short weeks, so make sure to stop by our one day sale this Friday, August 2nd, to get the best deal of the season! Most Whole Foods will also cook the purchased fish for you, which is a great deal if you think about, you can then eat it with salads, etc. Have one pound prepared cajun style and another with lemon pepper seasoning, you will really enjoy this fresh fish. Click on the images below to see how you can prepare salmon at home. Join us for an open air community celebration of epicurean delights, refreshing drinks, and wonderful music while being seated in the middle of Green St on Saturday, August 24 from 5 p.m. until 8 p.m.
Tickets for The Long Table are $75. A limited number of tickets are being sold, make sure to get your tickets now! Starting on Sunday, August 4th, the Old Pasadena Farmers Market will take place every Sunday from 9:00am – 2:00pm on Holly Street at Fair Oaks Avenue. This long-awaited addition to Old Pasadena will offer residents and visitors alike a chance to “buy local & buy fresh”. Free recycled canvas bags for the first 250 attendees on August 4th only. Starting on Sunday, August 4th, the Old Pasadena Farmers Market will take place every Sunday from 9:00am – 2:00pm on Holly Street at Fair Oaks Avenue. This long-awaited addition to Old Pasadena will offer residents and visitors alike a chance to “buy fresh & buy local”. Free commemorative tote bags will be given away to the first 250 attendees on August 4th only. These recycled canvas bags feature the market logo designed by the esteemed local illustrator Paul Rogers. Please note that while we adore all four-legged friends, dogs are not permitted within the market due to the California health code. Reports are that the Pasadena location of the popular Urth Caffe is set to open on August 18, 2013. More details to follow. The date is a week prior to the Pasadena Playhouse District Long Table Dinner for which tickets are still available. Spicy food, hot music and Oxnard’s cool ocean breezes are on the menu for the 20th Annual Oxnard Salsa Festival, July 27 & 28, 2013 in Oxnard, California. Plaza Park is the place for a two-day celebration of everything salsa – the food, the music, and the dance. You can taste it, you can dance it, and you can even take it home! Free admission and parking… it’s Southern California’s HOTTEST Summer Event! Two days of spicy foods and sizzling entertainment in downtown Oxnard’s Plaza Park. It’s Southern California’s HOTTEST summer event. One of the worse things that you can have happen with your money that you have invested in an IRA or 401k is to have your previous employer no longer offer to manage or support the investment, and elect to transfer the funds to a custodian like Millennium, the fees abound, from paper statement fees, to closing of the account fees, to other processing fees. You really have to watch out for these companies that make millions off fees, and make it difficult if not impossible to transfer and close your account, either ignoring requests and applications to transfer the funds out of their company. As a matter of fact Millennium has over $1 billion in funds. Read the story here from March 2013. My personal experience with Millennium has difficult at best, and when I received the statement when I closed the account, there was fees for closing the account, for issue a check, for sending me a paper statement, who knows what other fees are hidden in the business practices of Millennium, your investment could dwindle away with fees if you are not watchful, you are better off putting the money in a regular savings account. Or you can do what I did and transfer your a better investment vehicle with Lending Club IRA offerings. You read the reviews on Yelp on this company and even though they are not high in numbers the rankings are as low as possible. Searching the web trying to find the perfect knee brace or ankle brace for your sports injuries? Rest assured that you will find exactly what you need when you head over to betterbraces.com. Betterbraces.com stocks only the best knee braces and ankle braces available, including DonJoy, Aircast, and ProCare. Order now and get free shipping on ALL orders for betterbraces.com, the sports bracing and therapy experts. The Better Braces site features a variety of braces and sports injury products that focus on everything from arthritis, pain relief, rehabilitation, to injury prevention. The company also provides a convenient ‘Injury Info Center’ for additional information on common injuries that an athlete may suffer from. Are you looking for products that relate to a specific sport like baseball or football? Then head on over to the ‘Shop-By-Sport’ section of the betterbraces.com site. You’re sure to find the most affordable, high quality braces and accessories for everything from golf to football. 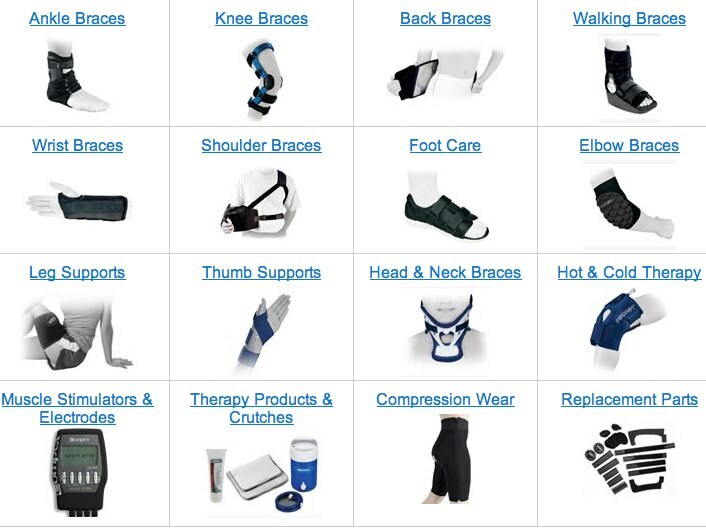 Although the company stocks a variety of braces and accessories, a majority of the products can be found in one of the following categories: ankle brace, knee braces, walking braces, back braces, foot care, elbow braces, head and neck braces, hot and cold therapy, compression wear, replacement parts, and muscle stimulators and electrodes. Shop with confidence while browsing the betterbraces.com store. All the products stocked are backed by a 90-day money back guarantee unless otherwise specified. You are also backed with a low price guarantee with price matches. When checking out, you’ll be happy to know the company only uses the highest standards available for financial transactions. Customer service is a top priority at betterbraces.com. Get in touch with a sports medicine injuries expert either by phone or email and expect a quick reply, experts are always on standby! Deliver is just as fast since the company uses UPS. Oh, did we mention, if you order now, you can get free shipping on all orders through betterbraces.com? Start shopping today! Which A Level Revision Style Is Right For You? One of the best ways to get on top of your revision is to work out which revision style is right for you. Don’t worry if this sounds difficult – it’s surprisingly easy. Your education should have given you a good idea of how you work best, so let’s take a look at the possibilities. What does this mean, you might ask? Each of these is a type of learning – and therefore, a revision style. We’ll run through the general characteristics of each, and then give you some tips for each style. Hopefully this will help you figure out which revision style is best for you, and how to make use of it during your education. Visual learners work best when they can use images and things that help them to visualise the work. If you struggle to listen to someone speaking, but find it really easy to memorise diagrams, you might just be a visual learner. How can you make use of this? Start colour-coding your notes – this will allow you to focus on the visual side of things, assisting your memory. Use memory maps and diagrams in place of written notes to revise from. You could even start associating images with certain ideas – for instance, think of formulae in terms of their visual effect, or visualise the scenes happening in Shakespeare. Maybe you just prefer listening, and everything else is a distraction. If you find you learn best from people explaining something rather than reading then this is the style for you. If it sounds like you, then start recording your notes. Rather than re-reading them, put them on your MP3 player and listen to them as you go about your daily business. Some auditory learners find music helps, so coming up with songs and rhythm patterns about your notes can be an excellent memory tool. If all of this sounds a bit over the top to you and you just prefer reading and writing then that may well be your learning style. If that is the case, writing and rewriting your notes is probably the most efficient method for you. However, don’t just rewrite them perfectly – work on compressing the same concepts into shorter and shorter explanations. This is great preparation for your exams! Do you fidget? Or perhaps you doodle? If you find you need to keep busy and move about as you learn, you’re probably a kinaesthetic learner. Walking around whilst reading or listening to lectures and doodling as you read passages are useful methods to a kinaesthetic learner. If you can make or model things, then this is the perfect use of your time, as it’s engaging your need to be doing something with your actual revision. Of course, you may well be a combination of these, so make sure you pick and choose what sounds most useful to you for your time in education. Author Bio: Sarah is a freelance writer with special interests in education. She recommends getting a private education from Lansdowne College. Call now – he’s waaaiiiiting! 1-855-704-3889 between 9 a.m. – 6 p.m. P.S.T. *Sorry guys, no returns on customized styles. Q: He’s really living in a glass box? A: Yes. But he has a tent inside to sleep in. and we like to personalize things using a real person. Q: Does he at least get to go to the bathroom? A: Yes, but nowhere else. Get your discount tickets here now. The 2013 L.A. County Fair runs August 30–September 29. In addition to carnival rides, a bustling market place, and an extensive kids’ zone, the 2013 L.A. County Fair hosts an impressive lineup of live musical acts, including War, Trace Adkins, The Bangles, Los Lobos and Los Lonely Boys, Demi Lovato, and Lynyrd Skynyrd. Guests can also peruse a brand new Star Trek exhibit for an additional fee. Celebrate the 91st Anniversary of the L.A. County Fair with yours truly, Kristy! I’ll be bringing you fun trivia, cool photos and even cooler promotions! Scientist at Cambridge University have found a cure for cat allergy reactions. They have discovered the protein cat dander, dander, now that they now what sparks the allergy, a cure could be on the market in 5 years! We will watch this one for those suffering from cat allergies like me. You may have heard that we’ve moved our Pasadena store to a bigger location and we’re christening our new digs with a grand opening event! Stop by the store July 25-28 and let us treat you to promotions and giveaways! Vendors will be on hand to demo the latest products on the market. For store location and hours click here. Please Note: Rental Department is closed on Sundays. the location in the Rite Aid shopping center on Altadena Drive just off Lake Avenue. You can read about Nancy’s Pastries and Greek Cafe in the Altadena Patch. Call for hours and specials: 626-794-9839. Tues. – Sat. 9:00 a.m.~ 5:30 p.m.
Here’s the yelp reviews of the pastries side. Join our Email List & Get 15% OFF! Sign up for Gaiam emails including special discounts, advance notice of sales, information on new products, free Gaiam Life newsletters highlighting articles, blogs and how-to videos to help you live fit, healthy, green and happy. We offer the highest quality branded products and services available, many of which are exclusively produced for Gaiam. Yoga Pants that deliver Wicking, Quick-drying, All-Around-Stretch Performance!! Slate.com has a name generator where if your name is Anthony Weiner it would give you a name of Carlos Danger.